OUTGOING Philippine National Police (PNP) Director General Ronald “Bato” Dela Rosa reminded members of the Cadet Corps Armed Forces of the Philippines (AFP) to live their lives following the tenets of courage, loyalty, integrity. In a nostalgic visit to the PMA which rendered him a testimonial parade prior to his retirement as Chief PNP, Dela Rosa underscored the importance of the positive influence the honor code bestowed upon him during his career. "It was a journey that I would take again without second thoughts if given the chance. As I speaking feel deeply grateful to the Lord for letting me pass this way in my life. I now journey on better armed with the experience of a lifetime and richly equipped with the ideals of courage, integrity and loyalty instilled in me by this great institution," said Dela Rosa, a member of PMA Sinagtala Class of 1986. Dela Rosa was placed into office by President Rodrigo Duterte on July 1, 2016 and will be replaced by incoming Chief General Oscar Albayalde after his official retirement on April 18, 2018. "I am thankful that here you are, our young cadets ready to be trained and molded into the officers who will carry on with the mission to serve God, country and the people," the police general said. Dela Rosa, who was with his wife, two daughters, relatives, his classmates and other high-ranking police officials both in the retired and active duty, admitted having low points in his career as PNP chief but pushed through by adhering to what the institution instilled in him. "I want to tell you that if there was one thing that carried me through the rough roads of my journey and help me weather the tremendous storm of life in the uniformed service, it was my deep adherence to the honor code," Dela Rosa said. 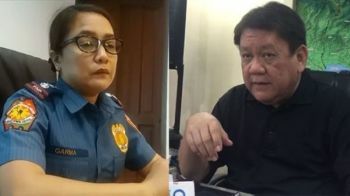 Following his goodbyes at Camp Crame and his alma mater he is set to oversee the New Bilibid Prison as the next chief of the Bureau of Corrections.